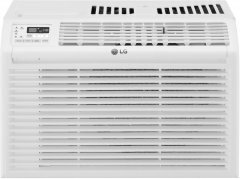 The LG LW6017R, which, at certain points, also belonged to AlphaChooser's list of the best low-profile air conditioners on the market, is a 6000 BTU air conditioner geared towards bedrooms or home spaces that do not exceed 260 square feet. Its features are led by a typical energy-saving mode that lets it power off whenever the desired temperature is reached and subsequently power back on whenever the room needs a bit more cooling. It also comes with an alert system for when its removable filter needs some cleaning. 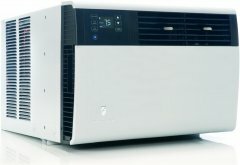 For a lot of the 739 reviewers that we examined, this 4-star low-profile energy-efficient LG model blasts some serious cold air, which is more often said of ACs within the 10000-14000 BTU range than ones with more or less 6000 BTU capacities. For a couple of other buyers, however, its very cold air is coupled with an operational buzz that makes it a bit noisier than some closely-comparable units, although it is quite easy to see how this can be a glass-half-full or glass-half-empty kind of thing. This low-profile AC, by the way, also comes with a remote control and has an hourly dehumidifying rate of 1.8 pints. 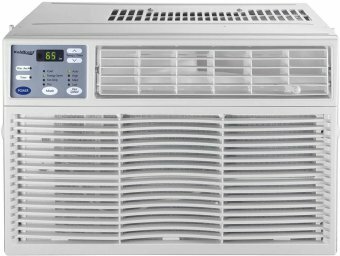 Additionally, while it suffered a few negative reviews attributed to units that did not cool the room whatsoever, the fact that only 12 percent (safely within the acceptable range for 6000-BTU ACs) of its review count were 1-star rants at the time of writing is a huge consolation. 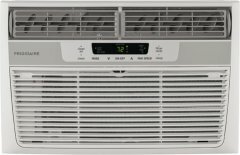 Anyhow, our automated shopping algorithm, whose job is to examine a total of 5596 reviews for air conditioners rated at 6000 BTU, tells us that the LG LW6017R is undoubtedly Alphachooser's best 6000 BTU window air conditioner 2019 (Learn how we rank items), especially with a confidence level of 100 (More on confidence levels) topping it off. 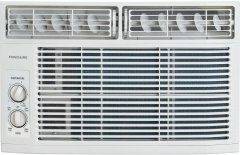 Dubbed by many of its 325 reviewers as one of the best-looking 6000 BTU window air conditioners out there, the Frigidaire FGRC0644U1, which, by the way, comes with an 8000-BTU big brother that's also listed here at AlphaChooser, scraps the idea of tactile buttons for what one user calls a favorably-sensitive touch panel. It also comes with an LED temperature read-out that seamlessly blends into its facade. A couple of its most-enthusiastic buyers even say that it's the nicest-looking AC they've ever seen, while another one loved its beautiful, minimalist design, noting that it's minimalism trickles down to its small, soft-touch remote control -- although the same user cautioned that its design might not be very convenient for those with less-than-perfect vision . A few buyers also noted that its filter grill, which is held in place by magnets, it very easy to clean. Another thing that users loved about the 4-star FGRC0644U1 is that it can be controlled over Wi-Fi using a mobile app, although a couple of users grumbled that they never got this feature to work. Additionally, there were no complaints about its operational noise when we were checking it out. 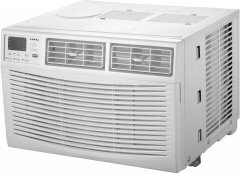 In fact, a good number of reviewers say that it runs way quieter than a lot of other 6000-BTU window-mounted AC units, with its upward air deflection (rather than directly towards users) serving as some kind of a cherry on top. Long story short, our shopping algorithm, which browsed through a total of 5596 reviews for air conditioners with 6000 BTU ratings, determines that the Frigidaire FGRC0644U1, with its rarely-seen (among window ACs) design concept, is easily one of the top 10 AC units in this category -- Alphachooser's second best 6000 BTU window air conditioner 2019, to be exact. 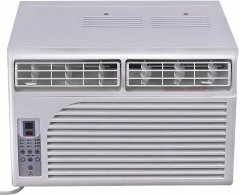 Primarily aimed at users who want to cool relatively-small bedrooms or home spaces that do not exceed 250 square feet of floor space, the Frigidaire FFRA0611R1 averages a user rating of 4 stars after being reviewed by 89 users. 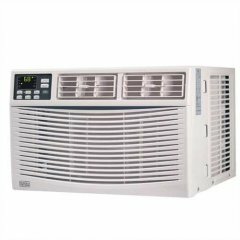 This compact 6000 BTU window air conditioner comes with a 1.3-pint hourly dehumidifying rate, a respectable 11.1 Energy Efficiency Ratio (EER), and an auto-restart feature that lets it resume operating with the latest settings when powering back up after a blackout. It also comes with a couple of wings for mounting, just like some of its rivals in this AlphaChooser list. Also like many comparable window AC unit's, however, the FFRA0611R1 drew some flack for its operational noise, with one disgruntled buyer likening its noise to a car engine, while a few others were alarmed by some rattling or scraping sounds. That said, noise tolerance is obviously subjective, not to mention that its ratio of 1-star reviews was pinned at a favorable 14 percent as we were checking it out. On the positive side, a good number of the FFRA0611R1's users agree that it's able to cool areas that are beyond its on-paper coverage. For instance, one user ended up installing it in a 576-square-feet cabin, where it managed to drag the temperature down by 20 degrees Fahrenheit . Another user reported that it handles their living room, which exceeds 250 square feet, desirably well, but, like several unsatisfied buyers, noted that it's not something one would call quiet. Other things users loved include its small size, easily installation, and simple controls -- it has one knob for temperature and another one for operating mode, doing away with a digital readout and a remote control. 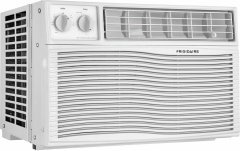 When it's all said and done, our shopping algorithm, which weaved through a total of 5596 reviews for 6000-BTU-rated air conditioners, concludes that the Frigidaire FFRA0611R1 is an Alphachooser good choice and, in other words, one of the top 10 6000-BTU ACs out there today. Rated at 6000 BTU, the Frigidaire FFRE0633S1 promises to cool rooms of no more than 250 square feet. 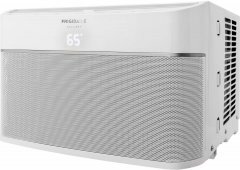 This relatively compact (as a few of its 1411 reviewers put it) unit's key features include a clean air ionizer for removing pollen and other allergens out of the air and a 1.3-pint hourly dehumidifying rate. It also boasts a 12.2 EER (Energy Efficiency Ratio), which was one of the highest EERs in this category as we were working on this AlphaChooser write-up. Going along with its EER is a comparably-low 44-dollar annual cost (Some of its competitors cost more than 45 dollars annually to operate), although one user cautioned about noticeable power surges whenever it turns itself back on. That said, many users still agree that it's an energy-efficient unit, especially compared to the slightly-older ones that it replaced. 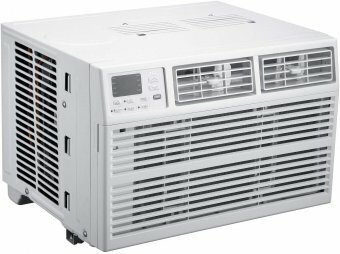 Aside from its power efficiency, a lot of this 4-star 6000 BTU air conditioner's satisfied buyers praise it for its rather convenient size, with one buyer saying that it's perfect for the entire third floor of their college house, which is roughly 15 degrees hotter than the lower floors . Another user commended it for keeping the temperature inside their studio apartment within comfortable levels all the time, while also noting that the full-function remote control is quite handy, particularly when trying to adjust the temperature at night. Being a window-mounted AC, the FFRE0633S1 was not immune to complaints about its operational noise, with some unhappy buyers reporting a horrible vibrating sound or calling it a rattletrap. Some reviewers find the noise level tolerable, though, at least relative to its cooling performance. 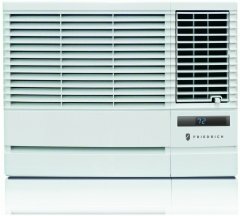 All said, our shopping algorithm, which aggregated 5596 reviews for 6000-BTU AC units, concludes that the Frigidaire FFRE0633S1 is an Alphachooser good choice, dominating the market alongside the top 10 units in this category. 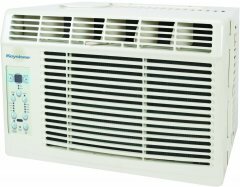 Frigidaire's FGRQ0633U1 is an energy-efficient (according to most of the 168 reviews that we sampled) low-profile window-mounted 6000 BTU air conditioner that's designed to cool rooms of up to 250 square feet. 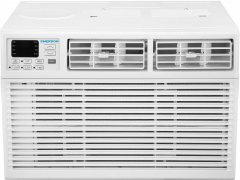 Its key features include a built-in timer that lets users program the unit to turn on/off in half-hour increments, three different fan speeds, and air vents that go up/down as well as left-right, the latter not being an everyday facet among tantamount ACs listed here on AlphaChooser. It also comes with a full-function remote control, although a couple of users complained that it was clumsy and feels cheaply-made, but then again, for a lot of other buyers, a remote is a remote. 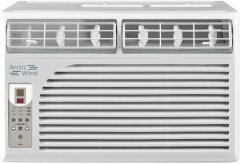 The FGRQ0633U1 owes much of its 3.5-star average rating to its apparently quiet operation, with many users calling it incredibly quiet and one of the quietest 6000 BTU window AC unit out there . Additionally, many of buyers love its modern-looking design, which, of course, is always nice to have, on top of an actual satisfactory cooling performance. A certain user noted that its LED readout is a little too bright, though, which might be a tad bothersome when you are trying to sleep. A couple of other complaints involve units that arrived with broken side panels or scratches as well as ones that were almost whisper-quiet at the start, only to eventually put out some incessant grinding noise. Nevertheless, its positive reviews still won out, at least around the time we were writing this -- 43 percent of our sampled reviews were solid 5-star ratings then. 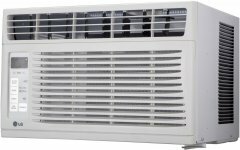 In the end, our review-crawling algorithm, which rummaged through 5596 reviews for 6000-BTU window ACs, determined that the Frigidaire FGRQ0633U1 may not be the absolute best, but it's nevertheless an Alphachooser interesting choice -- in other words, it is one of the top 10 units in this particular AC category.